Popular great white shark Mary Lee has made a return to the Jersey Shore, according to OCEARCH'S Global Shark Tracker. Mary Lee, who was right off the coast north of Atlantic City back in May, appears to be back in the area. 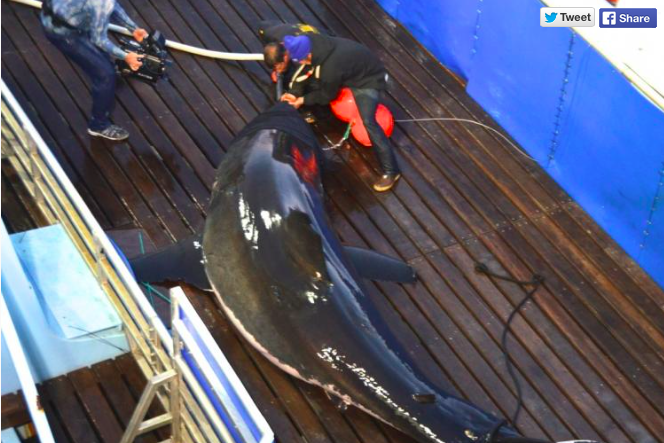 In the last three days, the great white traveled from Virginia Beach, Virginia, to Atlantic City in 72 hours, according to the Asbury Park Press. She showed up again on the Jersey coast on Wednesday. On Thursday morning, OCEARCH said the shark, which is 16 feet long and weighs 3,456 pounds, appeared to be moving north up the beach near Barnegat Bay. The shark's movements have been followed since September 2012, when she was tagged with a GPS tracking device by nonprofit research organization OCEARCH, which is devoted to the study, safety and tracking of sharks. You can follow Mary Lee’s movements here and donate to OCEARCH’s work here.